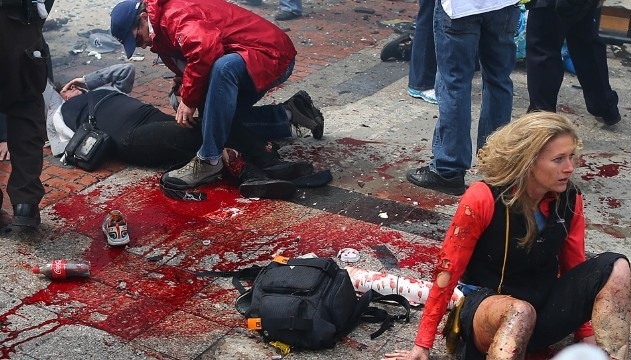 Horrible scenes in the news yesterday, when two bombs exploded near the finish line of the Boston Marathon, killing three people and injuring many more. I’ve visited Boston myself – it’s a beautiful place in some ways, with leafy open spaces and a bit more sense of history and tradition than most American cities. What you may not know is that it’s also a city with a rather unfortunate historical association with terrorism. The Provisional IRA raised substantial amounts of money for their campaign of violence there for years. Some of the bars in the city used to help out during the “troubles” by selling drinks called “Car Bomb” and “Kill A Brit”. In June 1981, the Massachusetts House of Representatives even adopted a resolution calling for the withdrawal of British Consul General Philip McKearney from Boston unless his government gave in to the five demands of republican terrorist convicts on hunger strike in British prisons. Perhaps one or two of the Bostonians who used to casually toss coins into a collection tin for the Provos during the ’70s and ’80s might have seen some of the images on the news, and reflected on the error of their ways. Terrorism. Not quite so funny on your own doorstep, eh? This entry was posted in Uncategorized on April 17, 2013 by admin. A sad day for the people of Britain and indeed for those who celebrate freedom and democracy the world over. 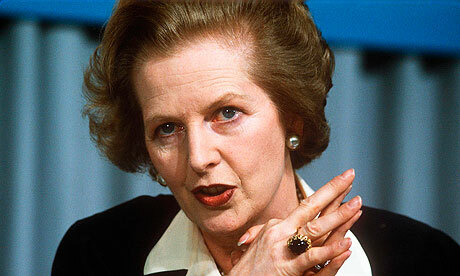 Baroness Margaret Thatcher died this morning at the age of 87. It is impossible to overstate her influence or her impact on the fortunes of these islands. She was a shopkeeper’s daughter from Grantham who became the first woman Prime Minister of the United Kingdom at the age of 53, in May 1979. When Mrs Thatcher came to power, Great Britain was, famously, the sick man of Europe, a country on its knees. Militant trade unionism and a world-owes-me-a-living culture engendered by socialism and the welfare state had devastated British manufacturing and exported jobs abroad in their millions. Public services turned into inefficient state monopolies by Labour were losing money hand over fist. Inflation was in double figures. A British Chancellor of the Exchequer, Denis Healey, had been reduced to begging for a loan at the feet of the International Monetary Fund. By February 1979, the infamous Winter of Discontent, the unions were holding government to ransom by orchestrating strikes in essential services, literally allowing rubbish to pile up in the streets. The dead were going unburied in Liverpool and Greater Manchester. She was the Prime Minister who had the determination and courage to bring to an end decades of decline following the war. She set free the nationalised industries, making them viable and efficient enterprises. She defended the right of the people’s democratically elected government to govern, where leaders before her of both political complexions had surrendered to the trade union barons. When a foreign power presumed to raise its flag on British territory, the Falkland Islands, in 1982, she led our armed forces to victory against them, ensuring that Argentina’s piracy was defeated. When Irish republican terrorists went on hunger strike in British prisons, she was happy to allow them to kill themselves rather than give in to their demands. But for me the engagement which most defines her time in power occurred in March 1984, when Arthur Scargill’s National Union of Mineworkers picked a fight with her government. The militant trade unions had been accustomed to having their own interests take precedence over the policies of democratically elected governments for years, but Mrs Thatcher decided that it was time for the British people to win for once. Her government had, after all, won a General Election by a landslide only eight months earlier. Scargill by contrast had not even dared to ballot his own members. A year later the people had indeed won, and the political landscape was transformed. The hard left unions had been neutered. Their corrosive capacity to disrupt British industry and send jobs abroad, as they had done to such devastating effect in the ’60s and ’70s, was greatly diminished. And they had forever lost their power to superimpose their own hard left agenda over the people’s choice of government. As Norman Tebbit put it so well, “we didn’t just break the strike – we broke the spell”. Thatcher has often been described as a “divisive” figure, but that badly misses the point. The British Left’s opposition to her, aided and abetted by a broadcast media largely sympathetic and supportive to them, was bitter and vitriolic. Her great crime from their point of view was her success. She had proved them wrong, consigned socialism in this country to the dustbin of history, made ours a society in which we could take pride, once again. How could the Left forgive that? She was the architect of the proud, economically prosperous and self-reliant Britain that arose from the ashes of the industrial nation destroyed by the Labour movement. In a real sense, she was the Mother of our Nation. It’s true to say that there was no great consensus for the course she planned, but had she waited for that, she could never have wrought the dramatic transformation in the fortunes of our country that she did. She was a conviction politician, not a consensus politician, as she famously declared herself. But she won the three General Elections that she fought by decisive majorities. Her convictions always carried the weight of a democratic mandate, and she always made it count – because she was a winner. She defeated Labour in three successive General Elections. She defeated the republican hunger strikers, the Argentines, the GLC and the NUM. She won her battle over the economy in the early ’80s. She even played a large part in facing down the Soviet Union and bringing to an end the Cold War. Perhaps the definitive mark of her precious legacy is that the first Labour government following her time in power, having already abandoned Clause 4 of its constitution in opposition, adopted a programme of privatisation of its own. “She didn’t just lead our country, she saved our country”. This entry was posted in Uncategorized on April 8, 2013 by admin. The Daily Mail ran a particularly lurid headline this morning, concerning the case of Mick Philpott, the Derby man who was yesterday found guilty of the manslaughter of six of his children, who died in a fire. 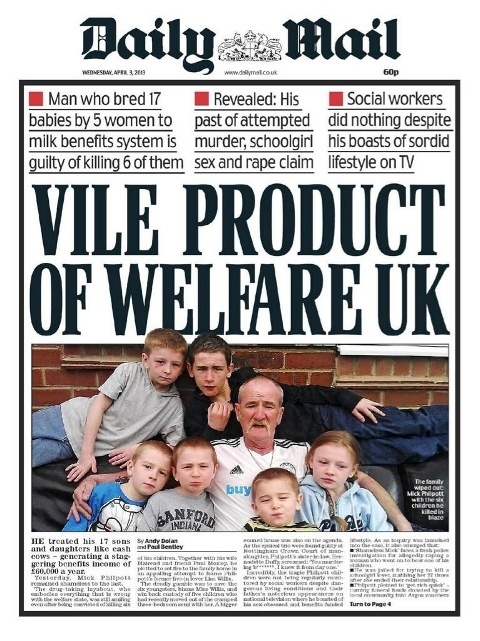 The essential problem with the Mail’s front page of course is that the children’s deaths and the circumstances that caused them are not actually a product of the welfare state. But without a doubt, the spectacle of a man like Philpott being able to father seventeen kids by five women and send the bill to the taxpayers without doing a day’s work himself is, in its own right, an important and indeed topical news piece. Nonetheless the newspaper has drawn shrieks of indignation on Twitter, as it always does. It seems to me that, unedifyingly sensationalist though it undoubtedly is, the Daily Mail provides a useful public service. It is a sort of social media idiot magnet, that draws out of the woodwork people who will happily become apologists for any cause, no matter how vile, in order to align themselves against the publication they love to hate. My own view is that the British welfare state is probably the single greatest crime perpetrated by a nation state against the totality of its people. Apart from being a black hole for taxpayers’ money, it contributed in no small part to the world-owes-me-a-living culture which did so much to export our jobs and industries abroad in the ’60s and ’70s. More importantly in the present day, it has created and sustains a self-perpetuating benefits underclass which is a reservoir for crime and anti-social behaviour. The Mail has at least provoked public debate about that, at the very time the government has embarked on a mission to set things right.